Sandy beaches, blue sky and temperate waters just comes down to great fishing. The variety of game fish in the waters surrounding Aruba year-round are astronomical. There are sailfish, white and blue marlin, wahoo, shark, barracuda, amberjack, kingfish, bonito and blackfin and yellowfin tuna. The abundance of fish almost guarantees that the visiting fisherman will make the catch of his choice. One can stand on the beach and cast out their line. If you prefer going out on a boat and didn't bring your own, full day or half-day excursions can be arranged through your hotel or by your direct contact with the captain. A choice can be made from the docks of the Seaport Marina at Oranjestad Harbor. Commercial fishing in Aruba is done on a small scale. 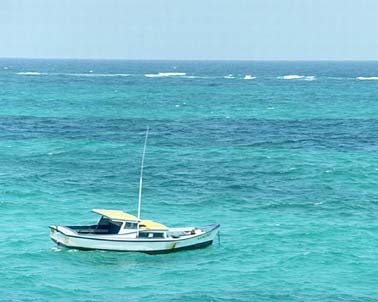 Bottom handling is the favorite fishing method of Aruban fishermen. This is done in small open-decked boats that are powered by one or two out-board engines. The boats usually stay within twenty kilometers from shore and are out between eight and twelve hours. Snapper and Grouper is the most sought after catch by the professional. The most impressive groupers are the Jewsfish which reach eight feet in length and up to seven hundred pounds. Fish trapping is also a traditional form of fishing that still survives today. Medal traps are set near reefs. Most often Gruns, smaller Snappers and Parrotfish are caught in the traps. The Big Eyed Scad is a local favorite. Aruba has miles of white sandy beaches and little bays where one can enjoy diverse aquatic sports like windsurfing, snorkeling, scuba diving, snuba, kayaking, water skiing, sailing and aqua-robics. 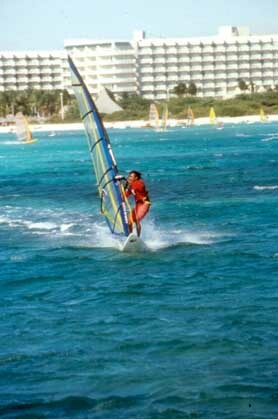 The most popular of the water sports is windsurfing. The strong winds that shape the divi-divi trees and keep the island cool have made Aruba one of the leading windsurfing locations in the Caribbean. The winds can exceed 25 knots. 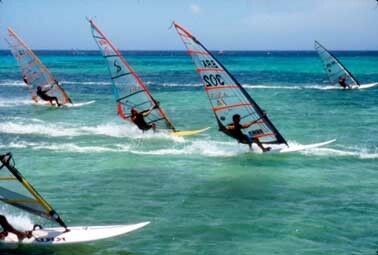 One of the most popular amateur windsurfing competitions in the Caribbean happens in Aruba with participation from 30 countries. The windsurfing competitions are held off the beaches near Fisherman's Hut at Hadicurari. Nothing can compare to the excitement of skimming across the water and being propelled by the wind. The relaxed atmosphere and available water sports give a visitor to Aruba all the trimmings for a vacation that will be a true success. This could be why most visitors to Aruba return again and again.